Tina's Crop Shop: April Scrapbook Sunday Blog Hop - Pastels!! Hello and Welcome to the April Scrapbook Sunday Blog Hop! I hope you're having a wonderful weekend and are ready for some awesome scrapbooking inspiration! I need you to bear with me on two points... #1 I'm still scrapping some of my pictures from my last cruise.. I know you've seen a lot of them. I'm sorry! #2 It was storming all day on Saturday so I was unable to get good lighting for the photos. I apologize for the poor quality picture! I tried I promise! Since the theme was pastel, I picked a Black and White photograph so that the color of our clothing didn't clash with the soft color theme. 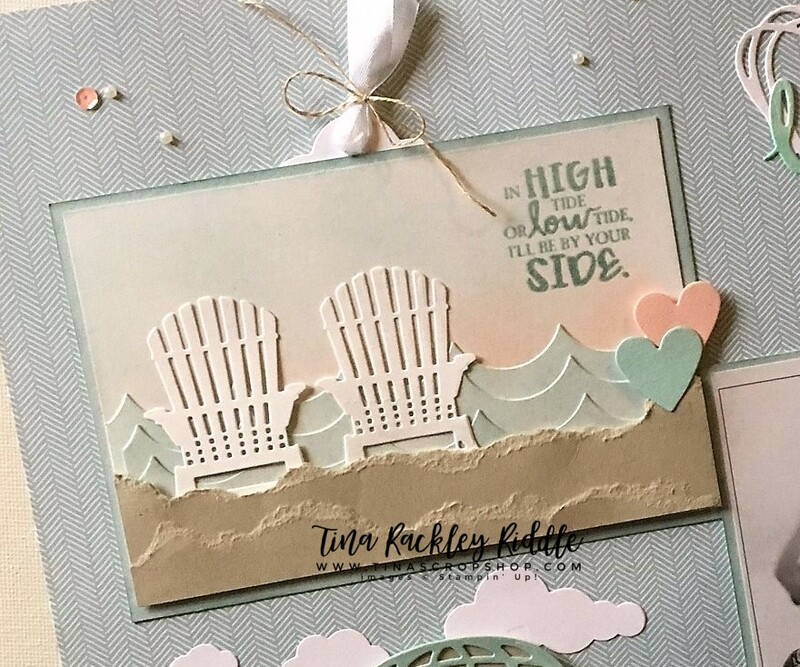 I love the sentiment from the High Tide Stamp Set and thought it was a perfect compliment to the scene I made with the Seasonal Layers Thinlits Dies. I love that you can use the scallop die from the Seasonal Layers Thinlits Dies upside down for the waves of the sea. I actually cut them out of whisper white cardstock and then sponged Soft Sky Ink instead of using soft sky cardstock. The background was sponged on Whisper White as well. I used Powder Pink on the bottom and more of the Soft Sky Ink on the upper part of the sky. The sentiment was stamped in Soft Sky Ink and then stamped in Versamark and then clear embossed it. The new Stamparatus makes it so super easy to do! After I cut strips of the Sahara Sand Cardstock I tore it pretty wavy to resemble sand dunes. I matted both the 4 x 6" photo and the 4 x 6" scene on 4 1/4" x 6 1/4" Soft Sky Cardstock. I sponged the edges of the mats with Soft Sky Ink to help them to stand out from the background of the Coffee Break Designer Series Paper. I loved that the pattern on this DSP was a soft sky and white chevron subtle design that allowed the die cuts to still show up and didn't compete with them. I finished this off with some Basic Pearl Jewels and some Iridescent Sequins scattered around the page. Of course I had to add some hidden journaling under my beach side scene. I used the Lots of Labels Framelits Dies to make my tag and cut off the bottom end to make a wide tag. A handheld 1/8" circle punch was used to punch a hole in the tag. Some white seam binding threaded through the hole with a bow of Linen Thread completed the tag. I was super happy with how it all turned out and I hope you enjoyed it as well. I can't wait to see what everyone else has created! 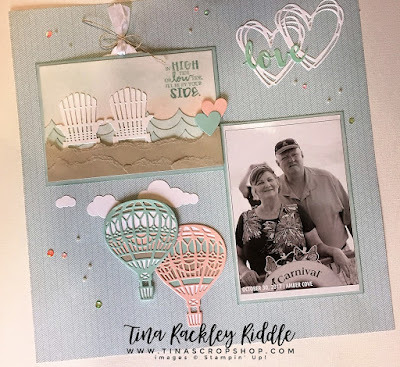 This is such an amazing group of scrapbookers and all have such varied styles! I am honored to be a part of the group and am inspired each month! Thanks so much for stopping by! Next up is Sharon Dalton's blog!